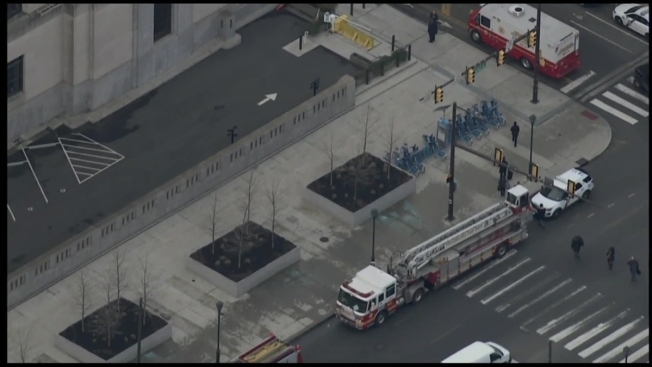 Emergency responders cleared the IRS building in Philadelphia’s University City Wednesday morning after a powder was found. Philadelphia firefighters could be seen responding to the facility at Market Street and Schuylkill Avenue around 8:30 a.m. after Philadelphia Police said someone discovered a powder in some cubicles on the third floor. Homeland Security responded and the building -- which is across the street from busy 30th Street Station -- was cleared as precaution, said police. As SkyForce10 hovered overhead, you could see people gathering outside for a few minutes before returning to the building after being given the all clear. No one was hurt and the powder turned out to not be dangerous, Philadelphia Police Chief Inspector of Homeland Security Joe Sullivan said. No word on the type of powder that caused the scare, which lasted less than 30 minutes.